The KeyraOx oxidizing cream formula gives you an even, softer and adhesive drip-free mixture. Combined with Keyracolors tints, it ensures exceptional results. Stabilised formula to maintain the peroxide concentration for longer. 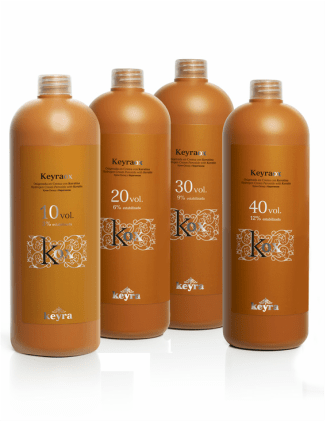 Contains hydrolysed keratin which aids in hair reconstruction. Acts by closing the hair cuticle. Makes hair shiny and soft, delivering incredible results after colouring. 10 Vol. (3%): To lighten one shade. 20 Vol. (6%): To lighten two shades. 30 Vol. (9%): To lighten three shades. 40 Vol. (12%): To lighten four shades. Bleaching: Add the amount needed to get an even mix. 900 ml bottle of 10, 20, 30 or 40 Vol. 100 ml bottle of 20 or 30 Vol.